...a traditional foods diet avoids processed ingredients, but allows meat, animal fat, and grains. It embraces cultured dairy, such as kefir and yogurt, that contain beneficial bacteria; fermented foods, such as sauerkraut and kombucha, that are rich in probiotics; and organ meats that are packed with vitamins and minerals. It also celebrates locally grown foods. By choosing ingredients from nearby sources, you create a stronger connection to your food, and have a better understanding what you’re eating and how it was produced. This attitude toward food reflected the way my own approach to cooking and eating had evolved over the past six months. First, I began incorporating organic milk and eggs into my regular diet. Next, I discovered that organic produce from the local Natural Grocers was often the same price as regular produce from my Safeway store, if it was in season. Then I began growing a few herbs and vegetables in containers on my deck, which inspired me to check out armfuls of cookbooks on vegetable-based meals, and finally, I began learning how to bake bread. By the time I read the introduction of The Nourished Kitchen, I discovered there was a name for the way I was eating and here was a cookbook that embraced that philosophy with simple, yet delicious recipes. After reading through the book, I chose two recipes to test out: the salmon baked in cream with dill, thyme, and sweet bay leaf, and the sourdough starter...which I then used to make the spelt bread. The salmon baked with cream and herbs was a delightfully simple to make, not even taking five minutes to assemble and pop in the oven, it was as easy as: place salmon filet in baking dish, pour cream over fish, toss herbs over fish, bake at 400F for 15 minutes. Perfect for a busy weeknight, yet elegant enough for a special dinner. It was delicious! The second recipe I tried out was the sourdough starter. Since I really enjoy baking slow rise, no -knead bread, this seemed like a logical next step. Jennifer's explanation of starting your sourdough starter is thorough and with the proper attention (feeding the starter must be done twice a day) you can be baking sourdough bread in 3 to 5 days. The Nourished Kitchen is going to be one of those cookbooks that will become a central part of my cookbook collection. 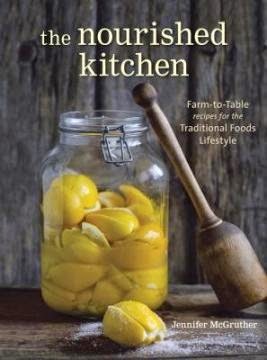 If you share my interest in cooking healthy, nourishing meals that lack nothing in taste...check out this book. FEC Disclosure: I received a free copy of The Nourished Kitchen in exchanged for an honest review.